Winslow Homer, "Home, Sweet Home"
I am at the point in construction that I have to make a decision about the backdrops. For the first section I used a photo mural that combined Brian Kammerer's art work with actual winter photos of the Potomac River watershed. This worked out great. The completed 12 ft section always gets compliments from visitors. But the next couple sections of the layout traverse some relatively hilly ground with two stream crossings. The first will be a short trestle over Clairbourne's Run. The second is a big gap across Potomac Creek. These two crossings will require special treatment to properly convey the perspective of the run (stream) flowing around the scenery. Trying to get the computer printouts to fit this area is going to be very tricky. I am also concerned that I can not get my scenery colors to match the backdrop colors. While it is not too obvious in person, it is very noticeable in photos. Therefore, I thought I'd take a stab at hand painting the backdrops. I think I can handle the ground, trees and details. I can not paint the sky and clouds as well as an actual photo. Here are some photos showing the results of the first section of hand painted backdrops. I actually enjoy the painting process, so the extra work is not an issue. The computer files are so large that they tend to bog down the computer, so working on the art process on the computer is not as enjoyable as it could be. So....... decisions, decisions? extension. Reconfiguring the benchwork in this area to accept the deep and long bridge scene was a lot more involved than we first anticipated. Not only did the benchwork have to be rebuilt, but the sky board had to be extended down to provide the depth needed where Potomac Run meets the backdrop. Although a bit of work, it was not difficult and it is coming along nicely. I am using Bondo Filler to patch the seam between the existing styrene backdrop and the lower extension. The big hole in the sky just visible at the right is to allow access to the main water shut off. It will be covered with terrain, or a structure. Alicia came down and gave the scene a "thumbs up." She also said she prefers the computer printed backdrop, but she only saw the initial phase of the test section. I was at the US National Gallery recently to see the "Art of Power" display. While attempting to "Home, Sweet Home." A scene showing two Union soldiers in camp during a lull in battle. In a brief glance I must admit I was blown away by the painting. I took a few moments to study it up close. The prints you see on-line do not do it justice. His color palette and techniques are flawless. The image just glows. Really amazing. I found it interesting that much of the painting has impressive detail except for the faces of the soldiers, which are depicted nearly featureless and in shadow. I think I have to move this one to the top of my list of favorite paintings. I was also impressed by the painting of The Virgin of Mercy with the Family of the Catholic Monarchs, c. 1486 at the "Art of Power" display. It is amazing that oil paintings can look that great after nearly 525 years. Again, the on-line image does not capture the radiance of the original. It's worth a trip to check it out,though the link above will take you to a Flickr site with images of all the of objects in the display. Stopping by the National Gallery during a lunch break is one of the unheralded perks of working in downtown DC adjacent to the Mall. We had a great work session tonight with 7 guest helpers showing up to help push the USMRR AC&F along. Marty McGuirk, Norm Wolf, John Drye, Jeff and Christian Peck, Mark Kempinski showed up to work, while my twin brother, Rob Kempinski visiting from Florida, regaled us with tales of his two under par golf round he shot earlier that day. I was there to witness it. Lets just say that Alicia and I lost more balls than holes to offset Rob's under par round. From Left to Right, John Drye, Jeff Peck, Mark Kempinski, Marty McGuirk. Norm skipped out before we could snap his picture. Left to right: Me, Mark and Rob - all three Kempinski boys standing by the future big bridge scene. To keep things organized I had sent out an email message earlier with job assignments, so everyone knew what to do. All was ready for them to jump to work. After a quick pizza dinner, Marty checked all track for missing spikes, Norm installed windows on the freight house building, Jeff disassembled some benchwork left over from the N Scale layout, JD worked on painting figures and Mark rebuilt the benchwork to accommodate the big bridge over Potomac Run. Christian played Call of Duty 4 on the XBox360 while Rob observed the action. I continued to add spline sections near Stonemans Station while helping answer everyones' questions. And lets not forget Alicia made chocolate chip-coconut macaroon cookies as a treat. They were excellent. not a stick type trestle. The 2x4 mock-up here is too tall and makes the bridge look too squat. On Wednesday, Dr Steve Clarson visited from Cincinnati and had a chance to check progress on the layout before he and I went to John Drye's house for a work session on his N Scale layout. The discussion on link and pin couplers reminded me of Harold Minkwitz's solution to L&P couplers in On30 scale. He documented it on his web page at Pacific Coast Airliner. He had 18 inch radius curves on his layout and the coupler swing on the tight curves caused L&Ps to derail the cars. So he devised a modified 3/16th inch staple as a "U" shaped hook to connect the cars. These allow for swing and provided near slack free operation. The coupler drawbars on the cars are basically modeled to scale. So in photos the cars look prototypical. I think this is very clever. I may try this idea if the link and pins prove too troublesome. Harold's site had lots of neat and useful information. He has since taken it down. We have started extending the railroad mainline from Falmouth to Stoneman's Station. I decided to try using spline roadbed for this part of the line in an attempt to save materials by avoiding cookie-cutting large sections of plywood. Here my brother is installing the first piece of pine spline roadbed. We are using a combination of pine lath and composite wood. The pine lath is 1/4 inch thick and is not flexible enough to bend to a 30 inch radius without pre-soaking (actually I now learned that this is not true. It can curve that tightly without soaking). For the tightly curved parts we are using a composite wood material available at DIY stores. The material is a combination of wood and plastic with a fair amount of entrained air that makes it light. I don't know exactly what the plastic is, but it is something like expanded foam. In any case it behaves a lot like a flexible piece of wood. There doesn't appear to be grain, but it can split if you don't drill pilot holes for screws. Since it is pre-painted with a gloss paint, carpenters glue doesn't hold it as well as raw wood. I decided to add a small trestle across a creek to the scene between Stoneman's and Falmouth, inspired by the scene at the left, actually on the USMRR City Point line. 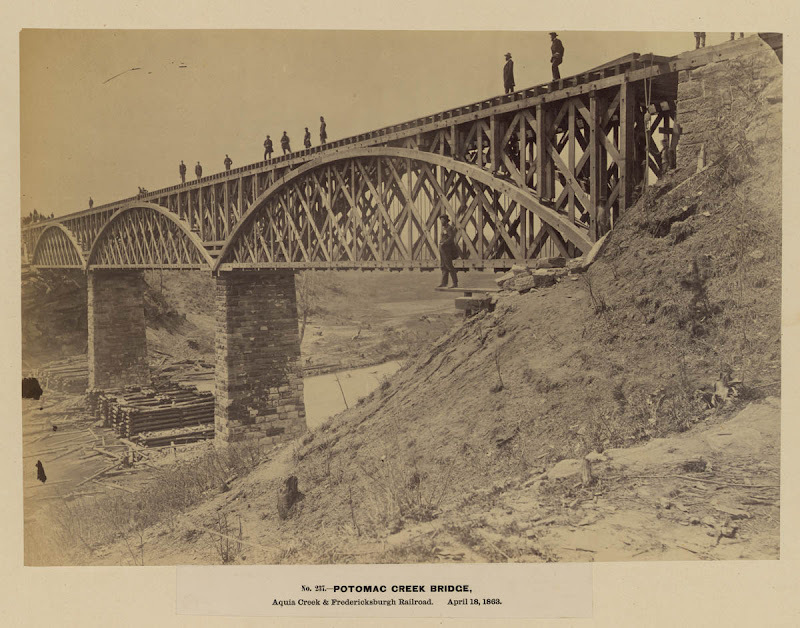 Note the rough construction of the bridge and the lack of fixed abutments. Since the Aquia line existed before the war, it is possible that stone abutments may have been used, as at Potomac Run. So I may use them instead. I'll make that decision later. This is not the big trestle over Potomac Creek that is coming later. Note the use of sills on the bottoms of the trestles instead of pilings driven into the ground. They also do not seem to use closely spaced bridge ties used in later bridge construction. Ties appear to be thin, certainly not the regular thickness normally used elsewhere on the railroad. To drop the terrain, we cut away the main beams along the length of the bench work and added splice plates below. This creates about 5 inches of vertical distance from the rail top to the creek bed, enough to house a small trestle. The pink area just in front of Mark's arm will be the location of the trestle. The advantage of splines is that they tend to assume natural easements as you install them. The trick is to ensure that you don't inadvertently create kinks or sections with too tight a radius. I made some 30 inch radius templates using 3/4 inch pink Styrofoam. These were easy to cut with a Stanely utility knife. When clamped to the white lath pieces they are doing a good job of holding the radius while we adjust the roadbed to the desired alignment. Initially I thought a 36 inch radius would work here, but alas, that was going to cause the track to swing too wide into the aisle. So I am using 30 inch radius. 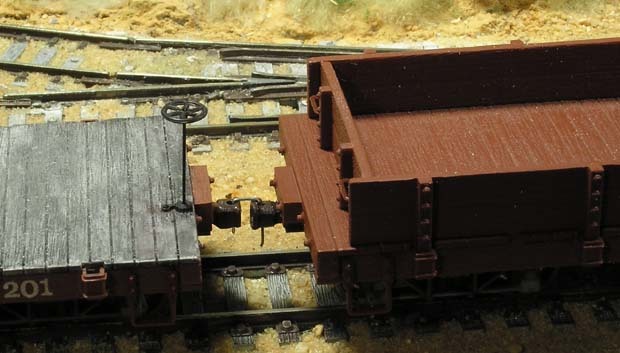 The photo shows some freight cars on the track to see how they will look. There will be an 1/8th inch thick Aspen Plywood section of roadbed on top of the splines and the ties will be glued to that. I am laser cutting the Aspen plywood to make bendable kerfed-roadbed pieces, but I'll discuss those in a future post as we install them. I am worried about running passenger cars on these tight curves. I'll have to build some passenger cars so we can test it out. Although things look good on paper, when it actually comes time to build, the big radii that O scale requires is a real challenge in my tight space. I am beginning to have second thoughts about using links and pins on my railroad. Although the prototype railroad used links and pins, they are tricky to use in model railroads. I haven't really given them a college try yet, as I only have 5 freight cars built and only three have couplers. But..... what little I have done has been problematic. They are very tricky to get coupled up and frequently the car you are coupling is derailed in the man-handling process! There is a design implication of using links and pins too. The harbor end of the layout would benefit from a pier along the back wall. It is difficult to reach portions of that area. It would be impossible to couple a link and pin in that area. So if I stay with link and pins, then I'll have to omit that track. But knuckle couplers aren't a perfect solution either, as there is no easy way to install a knuckle coupler to the front of an ACW locomotive without messing around with the cow catcher. The locos currently have an extended link like the prototype. Dave at SMR Trains says that this link wasn't designed to be used, it's mostly for show. However, I have tested it and it does work albeit with a lot of finicky fitting. I may have to make some links with slightly larger holes to allow easier insertion of the pin. Another solution I am considering is to leave the extended link on the pilot and put a rule in the timetable forbidding the use of the link by road engines except in emergency circumstances. This means that road engines could only switch using the coupler on the tender. That will make things tricky operationally. I intend to build one engine that will be designated as the yard switcher. It will have the cow catcher removed and a conventional coupler installed on the pilot (either link and pin or knuckle). I also plan to have either a turntable or wye at both ends of the RR to facilitate turning the locos.